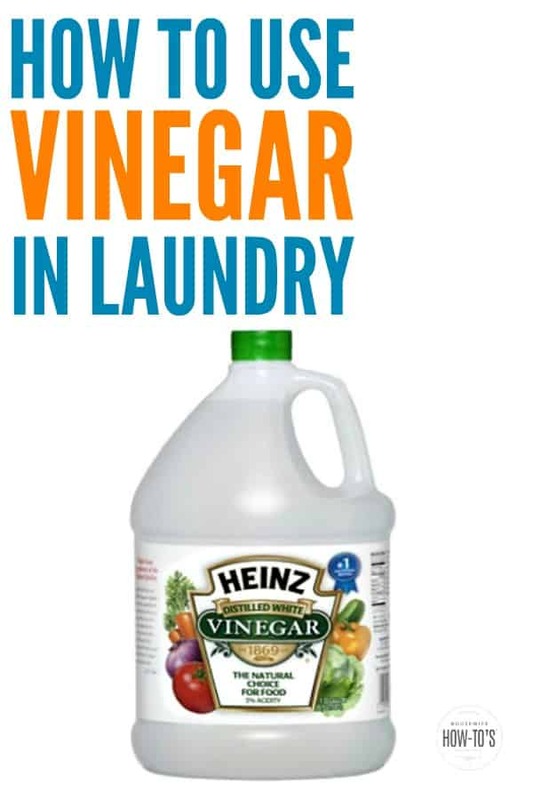 Once you know how to use vinegar in laundry, you can save a small fortune on expensive products. No condiment is more helpful around the house than white vinegar. It’s no secret that vinegar is the power behind homemade cleaners like my daily shower spray and DIY bathroom disinfectant. It’s also a miracle-worker in the laundry room, too. On clothing: Heat 2 cups of white vinegar to almost boiling. Stretch the fabric stained-side down over a bowl and pour half of the vinegar through it. As you pour, the vinegar will start pulling the stain out of the clothing. Rinse under cold water then soak the fabric in the remaining cup of hot vinegar for 20 minutes. Rinse again and launder immediately. On carpet: Heat 1 cup of white vinegar then pour it into a spray bottle. Add 1/2 teaspoon liquid dish detergent and swirl to combine. Blot the carpet stain with paper towels to remove as much wine as possible and then spray the stain with the heated, soapy vinegar. (Do not saturate the carpet or you’ll drive the wine into the pad!) Wait 5 minutes then blot with clean paper towels. Repeat if needed until the stain is gone. Just add 1 cup of straight vinegar to the rinse cycle. This is particularly helpful for folks who like to line dry clothing since vinegar will help reduce that “crunchy” feeling air-dried fabrics often get. Don’t worry, the smell will disappear long before the clothes are dry. If catching your machine when it switches to the rinse cycle is a challenge, you can use vinegar to make your own dryer sheets instead. If you’ve ever forgotten about a load of laundry in the washing machine (and who hasn’t) then you know that rewashing them doesn’t necessarily get rid of that awful mildew smell — it’ll reappear in towels and blankets the next time they get damp. To eliminate that smell for good add two cups of straight white vinegar along with the detergent when you rewash them, and use the longest, hottest setting the fabric can handle. Sweat, body oils, and fabric softener all build up in blankets over time. Eventually, your once fluffy, cozy blanket starts feeling flat and looking dingy. Get it looking and feeling almost new by washing it in a long cycle with only white vinegar and no other laundry products — not even detergent. The vinegar will cut through the buildup and loosen the fibers. If desired, you can then launder them again with detergent. Although useful, bleach can irritate skin and lungs, which is why many people with respiratory illnesses (and those with sensitive skin) should avoid using it. That doesn’t mean you have to give up cleanliness, though! Just add 1 and 1/2 cups of straight vinegar to the wash cycle along with your favorite detergent and run it through the hottest cycle specified by the fabric label. Note: if you’re using homemade laundry detergent or adding washing soda, wait until the rinse cycle to add the vinegar and then let it soak for 20 minutes. Give brand new jeans that buttery, lived-in feel without ruining them by washing them in a cold/cold cycle using 2 cups straight vinegar. Stop the machine before the rinse cycle and let the jeans soak for 20 minutes, then proceed. 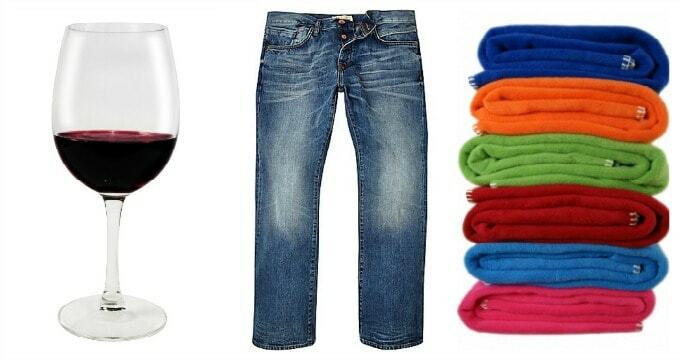 This will also set their color and help keep jeans from fading and is part of washing jeans the right way, so they last. On clothing: Put the garment in the freezer for 30 minutes to harden the gum then use the edge of a spoon to break away as much of the mess as possible. Next, heat 1/2 cup of vinegar to almost boiling. Place the clothing on a clean towel and gently scrub the remaining gum with an old toothbrush dipped in the hot vinegar. Repeat as needed until the gum is completely gone, then pour the remaining hot vinegar through the fabric to remove any residue. Launder immediately. On shoes: Scrape away as much of the gum as possible with the edge of a table knife. Place the shoe in a plastic or paper bag and put it in the freezer for 20 minutes. Use the knife to pry up any remaining, hardened bits of gum then wipe the area with straight white vinegar to remove any sticky residue. Knowing how to use vinegar in laundry means you can replace a number of expensive products, so remember to keep your pantry stocked with it! What can I do to remove/reduce static electritcy in clothes? What will help remove animal fur from clothes? Vinegar helps remove it. If you’re still having problems, you might want to read how to make your own dryer sheets. As for pet hair on clothing, wash smaller loads in larger amounts of water (e.g., a medium load with a high water setting). Lint rollers work well, too. It’s safe, but you may be reducing the detergent’s cleaning power. There’s a whole long, very sciency thread explaining why that can happen here. So, if your machine has a fabric softener dispenser, I’d recommend putting the vinegar in that. My blanket has recently gained patches of a very unpleasant “crunchy” texture. I’ve already tried normal detergent, without effect. Do you know of a cure doctor? Add 1 cup of baking soda to the wash cycle but no detergent, wash it on the hottest setting the fabric can handle, skip the fabric softener, then wash it again with your usual detergent but be sure you don’t use too much. How much vinegar do you use for a blanket? I want to make it nice and soft again. I’d wash it once with half the normal amount of detergent (to get it clean), then again with a couple of cups of vinegar and nothing else added to the load. The vinegar cycle will help remove any body oils or fabric softener buildup. Once I launder my blanket with vinegar, how should I dry it? Follow the manufacturer’s instructions. If you can’t find the tag, then a low-heat dryer should work for most blankets. Quilts should be line-dried. Can you please send me your recipe for roach balls using flour and borax I have misplaced my copy I had. Hi, Barb! You can find the roach ball recipe here. please could you clarify what is called a cup, surely that can’t refer to a drinking cup. A “cup” refers to an American unit of measurement. It’s equal to 237 ml or 8 fluid ounces. I am trying to get old antiperspirant stains out of regular T shirts. I am thinking about with the vinegar and water soak, and then launder. Should I or could I use the vinegar in my washing machine as well? Meaning after I soak the t shirts, when I launder, put detergent in and vinegar in the fabric softener cup? By the way I have a front load HE washing machine I don’t know if that matters. Thanks for all the info your site is one of the best I have found. I use vinegar in my fabric softener cup to prevent static, but I don’t think it fights stains at that point. To get antiperspirant stains out, try a 1:1 solution of warm water and warm vinegar and soak the fabric. If that doesn’t work, try an Oxyclean soak. Also, the best way to prevent them is to let the antiperspirant dry completely before putting your shirt on. Good luck!